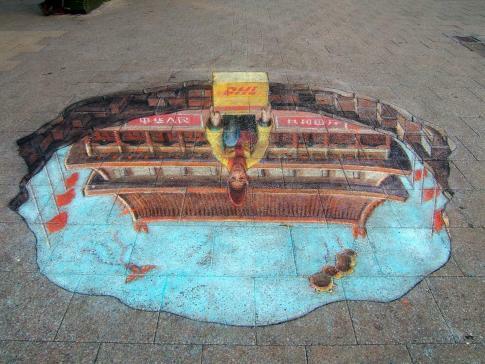 Julian Beever returns with another impressive 3d perspective chalk drawing, this one is a promotion for DHL and shows a hole to China through which a delivery is being passed. It would be handy if it were that easy to deliver a parcel to the other side of the world however the Earth being only one-foot deep would be something of a concern. i know thats another one of those 3d chalk drawings good job though!